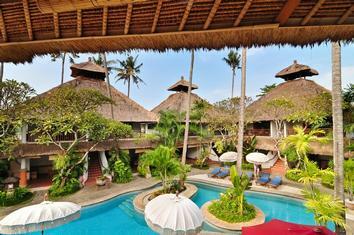 This pleasant hotel comprises a series of detached two storey Balinese style cottages with one room on each floor. Rooms are well-appointed with en-suite facilities, air conditioning and a balcony or veranda overlooking the landscaped swimming pool. 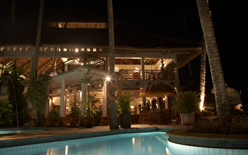 The Rose Restaurant serves European, Chinese and local specialities, while the unique William Bar, a sunken bar in the pool, provides drinks and light snacks. Other facilities include safety deposit box, 24 hour reception, room service, money changing facilities, fax service and car rental. 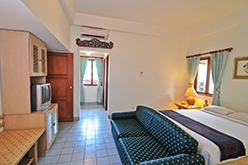 This hotel is very well situated for Benoa Harbour and therefore very suitable for overnight accommodation either before or after a liveaboard cruise. Airport transfers are not included. Local taxis are freely available and relatively inexpensive.